Seneca County commissioners unanimously approved construction of a new joint justice center on Courthouse Square during their meeting Tuesday, regardless of what Tiffin City Council decides. Earlier, the board agreed to make a decision by Tuesday on where to locate a possible joint justice center. Much of the discussion during the board's work session involved Tiffin Mayor Aaron Montz's proposal, offered at a meeting of commissioners and Tiffin City Council Thursday, to use East Tower as the center. The resolution commissioners approved spelled out the county's duty to provide county residents with safe, accessible court and office facilities, and to consider the cost of construction. It also stated the county would review proposed building plans with enough flexibility to include all four county courts and Tiffin-Fostoria Municipal Court. The resolution invited the city to participate in the project, but county commissioners stated they would move forward, even without the city's participation. Board of Commissioners President Holly Stacy said the new courthouse would house common pleas courts and Tiffin-Fostoria Municipal Court, if the city agrees to participate. Probate and juvenile courts would be located in the Courthouse Annex, she said. Montz and Tiffin City Council expressed disappointment with the county's decision during their meeting Tuesday evening. Montz said after the commissioners meeting that he was "deeply disappointed" in the commissioners' decision to place the justice center on Courthouse Square. He said he has a list of options for Tiffin-Fostoria Municipal Court and he did not include a new building on the Courthouse Square as an option. "It didn't make the top five," he said. Seneca County Commissioner Mike Kerschner said his issue with Montz's proposal was that the county and city had agreed there would be no public comment during the Thursday meeting and and there would be no call to action; both, he said, were violated by the proposal. During the council meeting Tuesday, Montz apologized for the "aggressiveness" of Thursday's proposal to use the East Tower as a joint justice center. Reading from a prepared statement, Montz said he worked on his proposal up until the start of Thursday's meeting, so he did not have time to run it by council or commissioners. With Tuesday's deadline by commissioners, Montz said he wanted to ensure he had enough time to make the plan public, and apologized. "In retrospect, I should not have tried to force it out at the end when time was running short, and I should have run it by Tiffin City Council first," he said. "I am passionate about Tiffin and where I want to take our fine city. ... Every action I take has what is best for Tiffin in its heart." Montz said although he is disappointed in the commissioners' vote, he respects the decision. He said a joint center still should be discussed, although a building on the green space does not rank highly in his opinion. Montz also said there were merits to East Tower along with the benefits of a joint justice center, and he is to work with city council to evaluate other options. Council President Rich Cline said he appreciated Montz's statement and was glad Montz said he should have sought council's approval. Cline said while Thursday's meeting was not the time to make a proposal, he hoped the city and county still could work toward cooperation on a justice center. Council members agreed with Montz about the county's decision. Councilman Rich Focht said he shares Montz's enthusiasm for the community and Montz's passionate proposal showed his desire to see things happen in the community. "If you don't have passion, you shouldn't have this job," Councilman Mark Hayes said. Before the vote at the commissioners meeting, Stacy said the biggest surprise of Montz's proposal was that the county would shoulder $8.5 million in renovation and construction costs at the East Tower site. That is more than the shared expense of a joint justice center on Courthouse Square, Stacy said. Commissioner Mike Kerschner said Montz's proposal was null and void because it had not been considered or approved by Tiffin City Council. Commissioner Fred Zoeller said prior to the Burgess and Niple study being completed, public officials agreed the highest price for a building that would meet all needs was $8.5 million. If the city agrees to partner on the project, the cost of a new building at an estimated $8.5 million would be divided between the county and city. If the East Tower was renovated and all parties agreed to Montz's proposal, the county would have to pay at least $8.5 million, which would make the cost "substantially higher," he said. Also, Zoeller questioned the proposed agreement regarding overage costs. In Montz's proposal, the county would pay for any new construction costs over the estimated $210-per-square-foot while a city-led coalition would pay for any renovation-related overage costs beyond the estimated $180-per-square-foot. Zoeller questioned what would be deemed renovation and what would be new construction costs. He said it would difficult or impossible to determine which entity would pay for overages on items such as a heating, ventilation and air conditioning unit, which would effect the renovation and new building. Kerschner also said he was disappointed with Montz's request that the county sell Courthouse Square to the city for $1. He said it was the most valuable piece of property in Tiffin and the proposal was "uncomfortable" and "insulting." Stacy said the land is not for sale nor would the county put a price tag on the square. Zoeller also said there could be conflicts in a private entity owning the justice center for five years if historic tax credits were pursued. Kerschner said there is a $3.7 million difference in the two proposals. Stacy said with no guarantee historic tax credits could be obtained, the county would be put at risk. Kerschner said even with possible tax credits, a difference of $2.2 million remains. "'Only' and '$2.2 million' don't belong in the same sentence," he said. Zoeller agreed and said it was the board's responsibility to be good stewards of taxpayer money. He also said delays could mean higher interest rates and a higher final price tag. Staying on or near budget for a new building also would be easier than with a renovation, according to a statement released by commissioners after the meeting. Kerschner said he had asked Montz via email if the city would be willing to make up the difference if tax credits and grant money did not come through, and had yet to receive a response. He said business and activity linked to a courthouse should have a greater economic impact on downtown than what might be generated by keeping the green space. Repurposing the annex as a result of moving courts into East Tower would come at a cost, Stacy said. 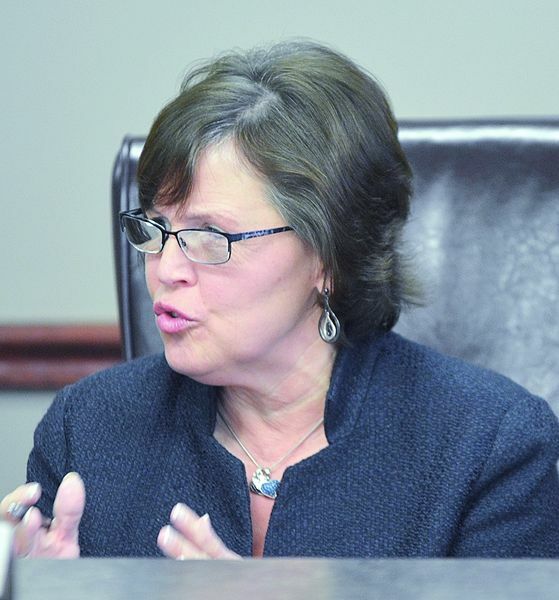 She also mentioned a previous design for a new building at Courthouse Square, and County Administrator Stacy Wilson said it would take little to no cost to update it. During public comment before the commissioners' vote, county resident Kimberly Groth questioned Zoeller's comments that he wished National Machinery LLC President and CEO Andrew H. Kalnow would have discussed his intention to donate $500,000 to the project privately and Kerschner's wish that Montz would have discussed the proposal with him during their lunch Thursday afternoon. She said it was bothersome that both would be open to suggestions made privately but were not open to offers made publicly. She appreciated Montz's transparency on the matter, she said. Zoeller said one-on-one conversations between a commissioner and another public official are legal. Tiffin City Councilman Jim Roberts said he was happy the city and county had the opportunity to discuss the issue and compared the joint center talks with the process of combining Tiffin and Fostoria municipal courts. He said the collaboration between all parties worked because they had one goal in mind and they could leave personalities at the door. Sheriff Bill Eckelberry, Common Pleas Court Judge Michael Kelbley, Seneca County Common Pleas Court Judge Steve Shuff, Probate and Juvenile Court Judge Jay Meyer and Tiffin-Fostoria Municipal Court Judge Mark Repp expressed support for locating the justice center at Courthouse Square. 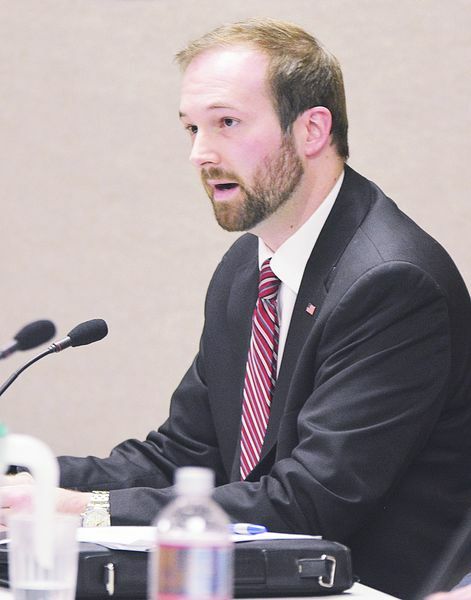 Meyer said the approved resolution appropriately addresses the issues of accessibility and space, while Eckelberry said a single new court space would be easiest to secure. Repp said while municipal court was a smaller stakeholder in the center, residents most likely are to have contact with municipal court. He said a new building would almost double the court's square footage, along with eliminating his concern about co-mingling of defendants and the public. He said it was important for judges to voice their opinion on the courthouse since they will be tenants. After commissioners voted, Repp said he hopes the city will join the process. "I am hopeful that our partners with the city will look at this, and not look at this as an affront, but as a constructive process moving forward," he said. "We will not have this opportunity to have a joint justice center again in the next 150 to 200 years." In public comment following the decision at the commissioners meeting, county residents supported the board's decision. Loretta Miller said the county was moving forward in a positive manner in creating a space that is accessible and applauded the board for not prolonging the process. She said the county was using taxpayer money wisely. Cindy Hunt-Dunne said she knew the board has the best interest of Tiffin and the county at heart, and while not everyone will agree on the final solution, she knew they could work together to build the community. During the council meeting, Repp spoke to council about his decision to support the county's decision. He also said he had not been asked by council about his opinion on where the justice center should be located and council needs to keep in mind it is the Tiffin-Fostoria Municipal Court that would be occupying that space. He reiterated the need for additional discussion on pursuing a joint center. Shuff also spoke to council, saying the city and county should continue to discuss East Tower as an additional office building. He spoke about moving offices from the RTA Building into East Tower and razing the RTA Building. Resident Victor Perez said Montz did not have to apologize nor should he be punished for attempting to come up with another solution. Council members agreed to maintain open communication on the possibility of sharing a justice center with the county. Cline said the city had to focus on providing space for all court facilities, along with pursuing collaboration with the county and keeping the center in downtown Tiffin. While he said restoring East Tower was his ideal plan, if they cannot do it, they need to move forward on something else. Montz said he is considering other options and is to request a committee of the whole meeting to discuss those options. Included in his options was investigating additional grant funding sources. Grants could fund 15-35 percent of the project and should not be discounted, he said. Montz said the city cannot allow the county to dictate city deadlines.